Annual forages can provide high quality grazing for cattle in the fall and winter and can complement the cover crop goals of providing agronomic and soil health benefits. Photo credit Jerry Volesky. 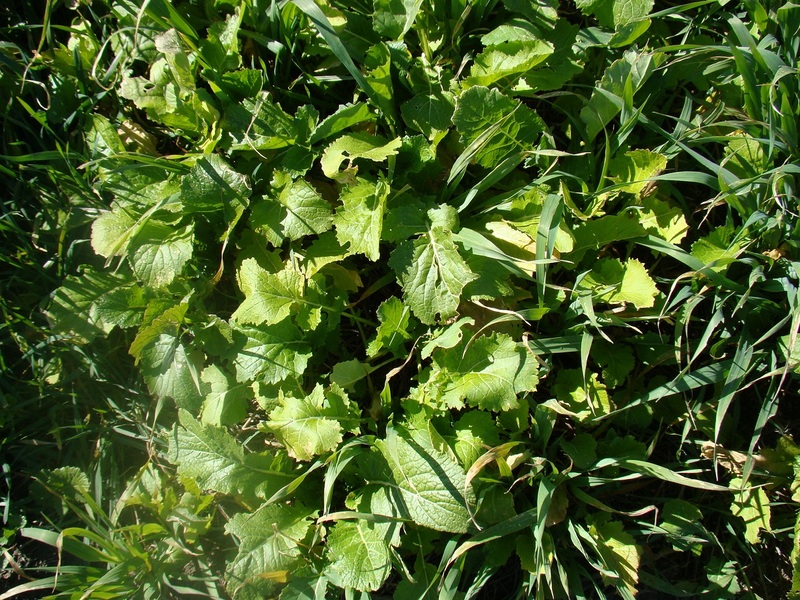 Oats and brassica forage when planted in late summer can provide high quality grazing even after killing freezes into January. Producers utilizing oats and brassica forage should consider grazing them with cattle that can make the best use of this high quality feed. Research was conducted by the University of Nebraska in collaboration with the USDA Meat Animal Research Center near Clay Center, Nebraska to analyze how forage quality changed through the fall and winter. For this study, oats, turnip and radish cover crop mixes were planted in late summer of 2014 and 2015 on irrigated pivots. Planting occurred on September 8 in 2014 and on August 25 in 2015. Forage samples of oats, turnip and radish tops were collected on November 6, December 9, and January 13 in the first year of the study. In the second year, samples were collected on October 22, December 10 and January 14. Nutrient analysis was conducted to evaluate the in-vitro organic matter digestibility (IVOMD) and protein content of the forages, both of which are measures of quality. In-vitro organic matter digestibility (IVOMD) measures through a laboratory analysis the estimated available energy in a feed to a ruminant animal. The digestibility of the forage was high from the November through January time frame when the study occurred. The brassica forage tended to maintain its quality better, ranging from 81-90% IVOMD with the oats ranging from 67-79% IVOMD. There was a year effect for oats in the study. The earlier planted oats in 2015 were not as high (69%) in IVOMD as the later planted oats in 2014, which where were measured at 80% IVOMD. Earlier planted oats will tend to grow more total forage and be further along in maturity than later planted oats when a killing freeze occurs. Differences in planting date for the brassica forage did not impact forage quality between years. For both the oats and brassicas, it is worth noting that while the quality of the forage did tend to decrease from the December to January measurement, the samples obtained in January were still quite high from an energy and protein standpoint. Even though killing freezes had occurred and the forages had transition from a green to brown color, when averaged across both years, oats had an average crude protein content of 15% and an IVOMD of 67% in January. The average quality of the brassica leaves was higher with an average crude protein near 25% and an IVOMD of 82%. The digestibility of the turnip and radish leaf forage would be close to the energy value of a concentrate such as corn. The sulfur content of the forages was also measured throughout the sampling period. The percentage of sulfur in the oats was less than was identified in the radish and turnips which was very high. It would be recommended that brassica planted for grazing are mixed with low sulfur forage such as crop residue or an annual grass to reduce the potential risk of sulfur toxicity. Annual forages can provide high quality grazing for cattle in the fall and winter and can complement the cover crop goals of providing agronomic and soil health benefits. More information on utilizing annual forages for livestock as part of cropping systems can be found at beef.unl.edu.